It’s that time again. The leaves are changing colors, the nights are cooler and fall is (almost) in the air. 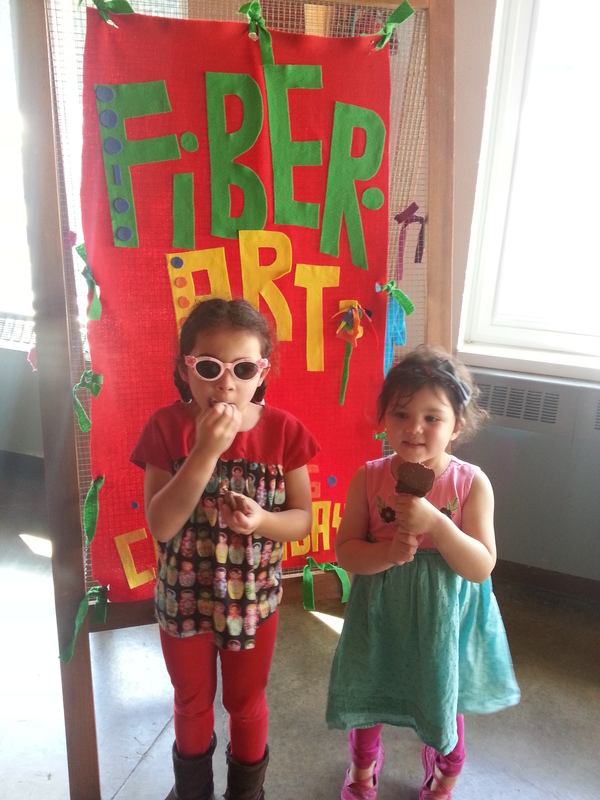 It’s time for the annual WNY Fiber Festival! The girls and I have made it an annual tradition over the last few years and they have grown to love it even more than I have. 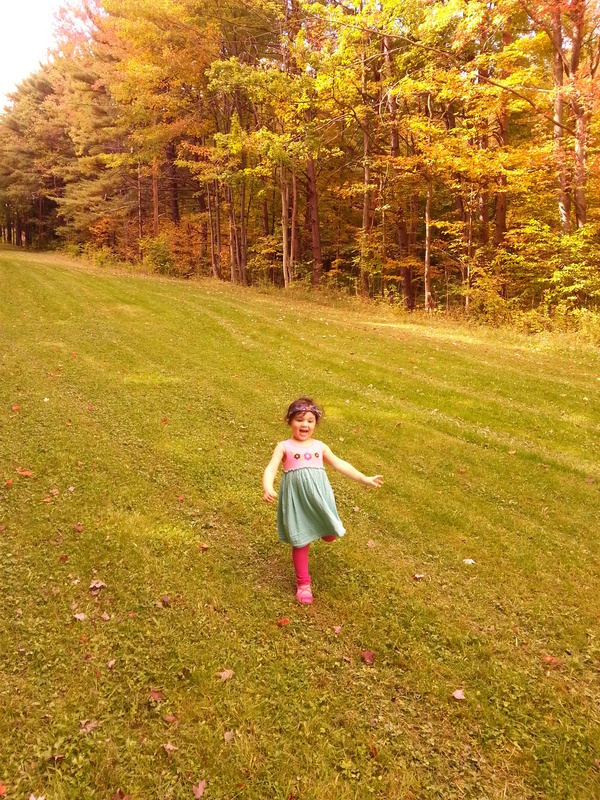 The girls love to go to the “country” and run around, check out the animals and indulge in treats. I go for the yarn/fiber of course, but it is so nice to see the girls so entertained by all of the “other stuff”. 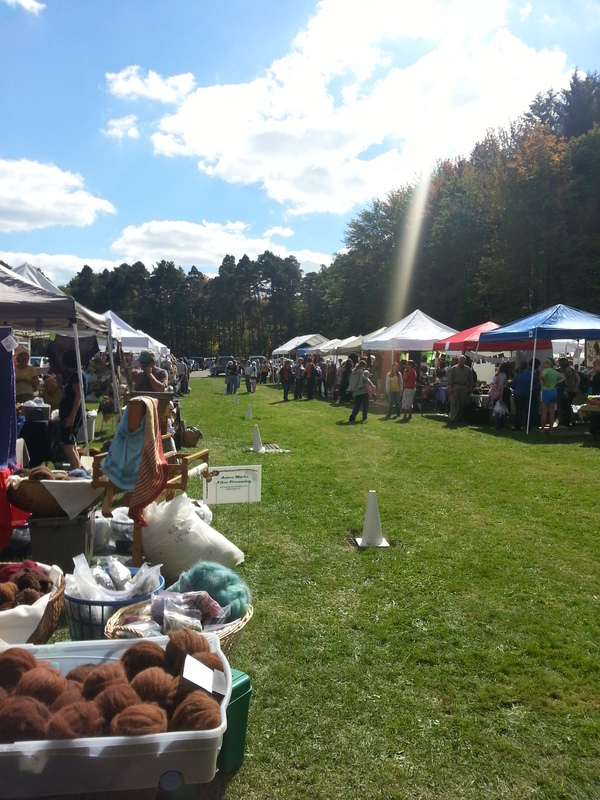 Today was an unseasonably warm and sunny day and you couldn’t ask for a more beautiful backdrop to the festival. If you are local and interested for next year, the website can be found here. My favorite stands this year were of course my friends. Have to give them some publicity on this blog (not sure how many people read this but still!). 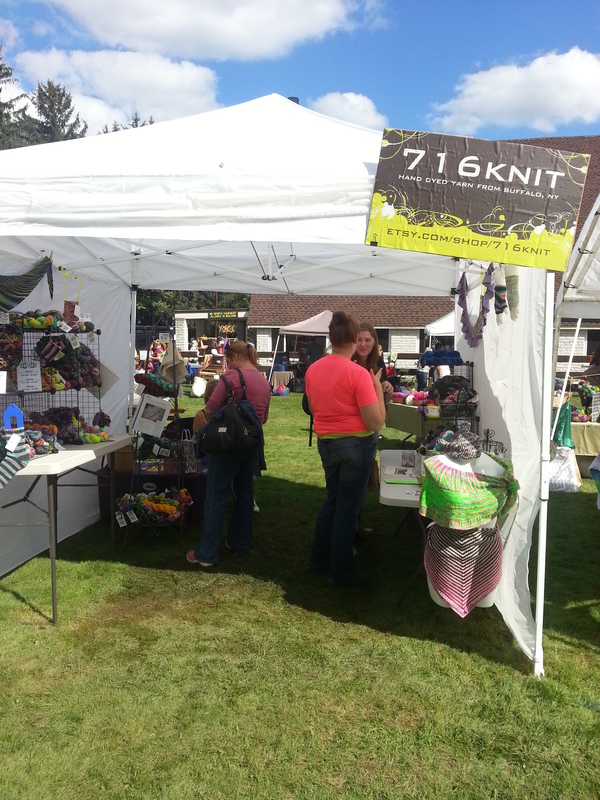 First is Jenna of 716Knit- awesome, awesome, awesome hand-dyed yarn. My absolute favorite yarn to knit with, so unique. 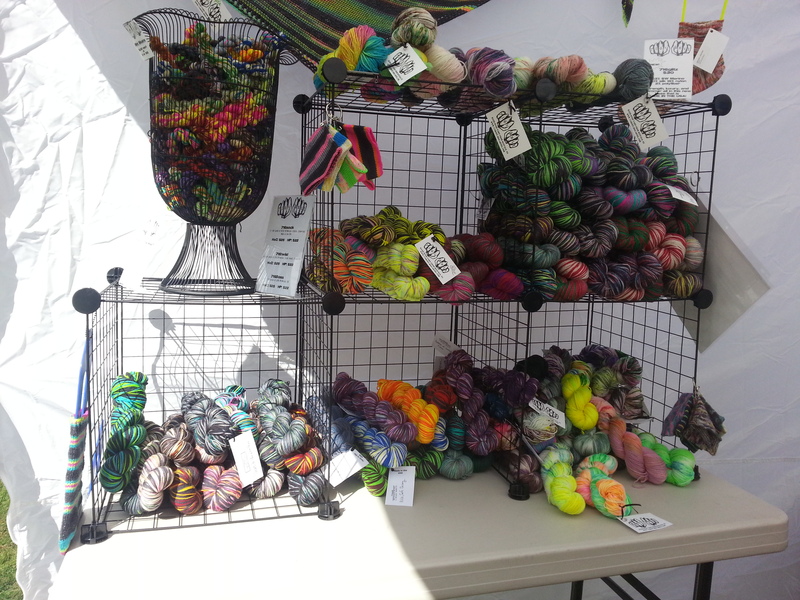 If you knit or crochet you have to check out her site and give her some business, so great. Check it out here. Another friend started vending this year- the Drunken Homemaker. 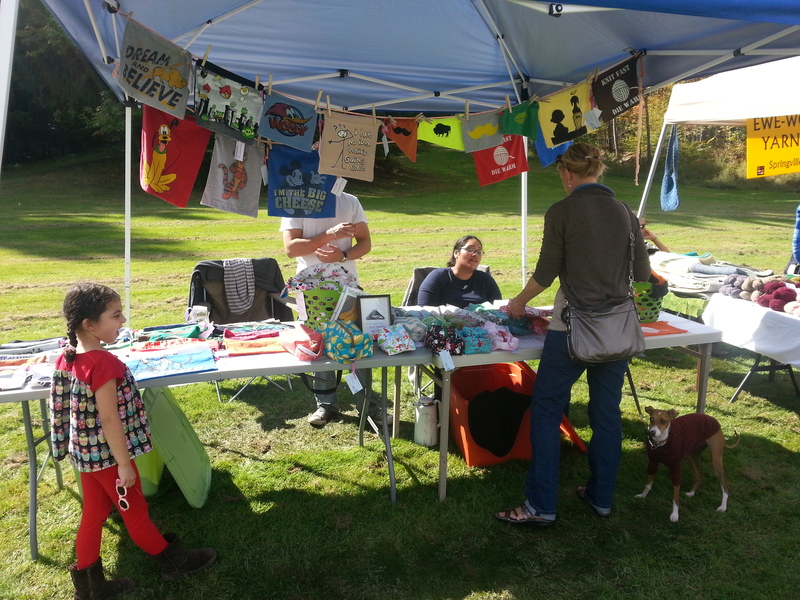 She makes the cutest project bags and t-shirt drawstring bags. I couldn’t resist picking one up…I swear she must have a secret- she finds the greatest t-shirts to upcycle into cool bags for your knitting/projects. I seriously wish I had thought of this idea first. So great. Her project bags are so well made, and she has a great assortment of fabrics too. Check her out here. Looks like her site is on vacation right now, but keep checking! 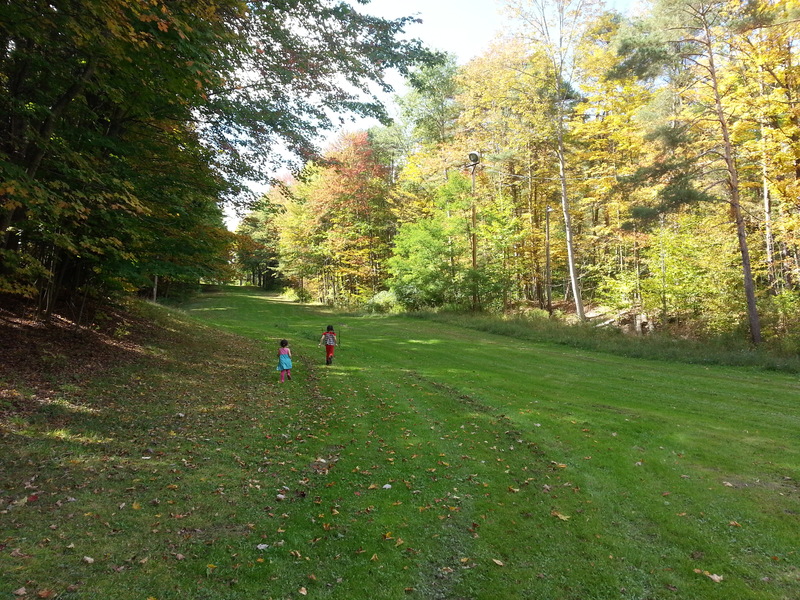 Of course the girls favorite part was just being silly and running around in the “forest” and down the hill. Cue the Little House on the Prairie theme song. 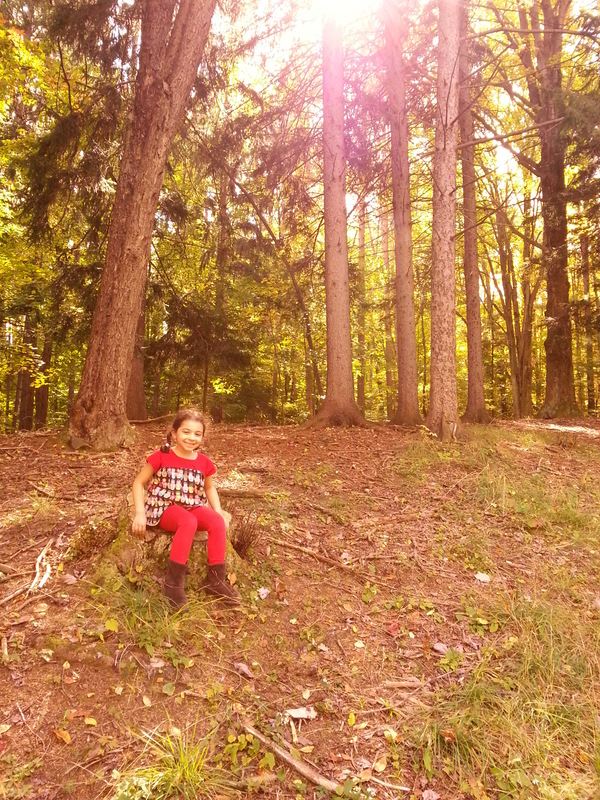 The sun shining through the trees made for some beautiful photographs. Not sure what I pressed on my camera phone to get these effects, but I love it! It turned out to be an absolutely wonderful day. 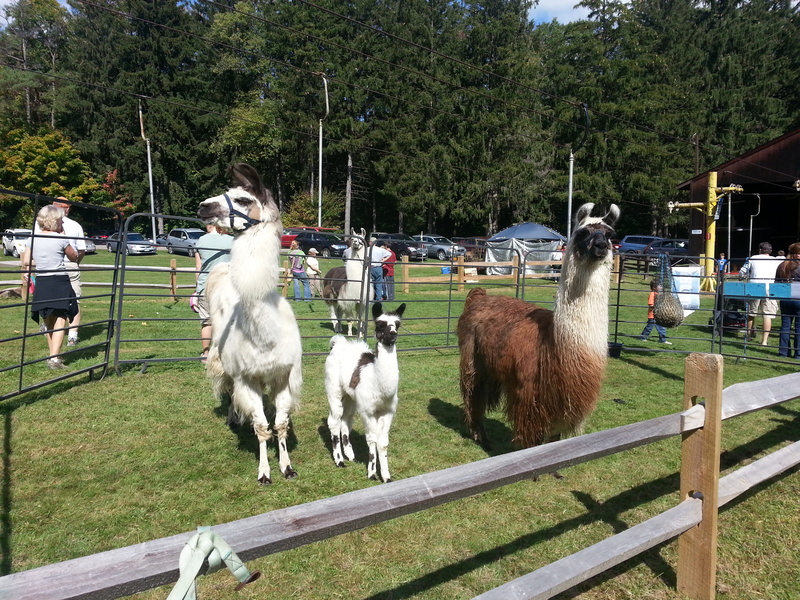 Really, how can you resist a baby Llama? So cute. Now onto what I bought! 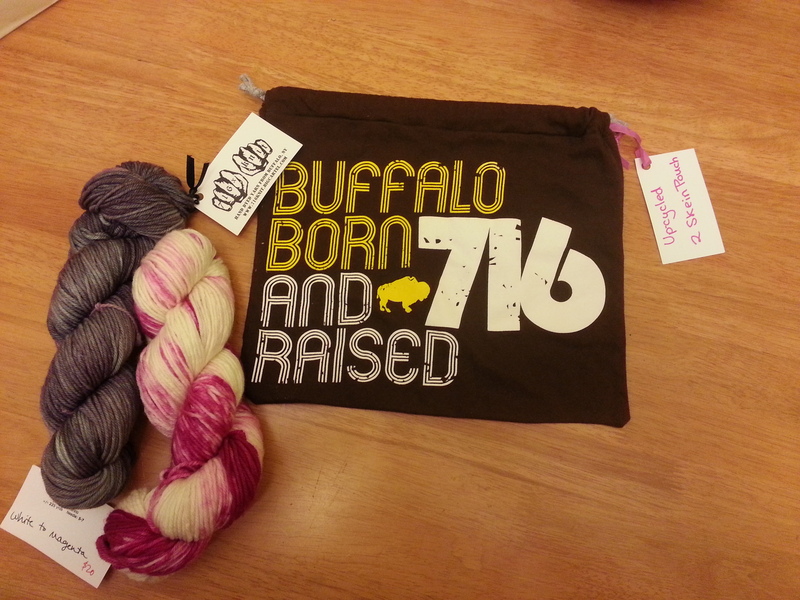 Here is what I scored today: the Buffalo project bag from Drunken Homemaker,and two skeins of yarn from 716Knit. I totally restrained myself, it helps to hit the ATM first and limit yourself…dangerous now that so many stalls take credit cards- NOOOO! I stuck to my budget though and feel good about it. More money for fabric- woo hoo. Can’t wait to check out Ravelry and pick a pattern to knit up with this yarn…hmmm…something for me? What’s black and blue and (then) red all over? Pretty neat. 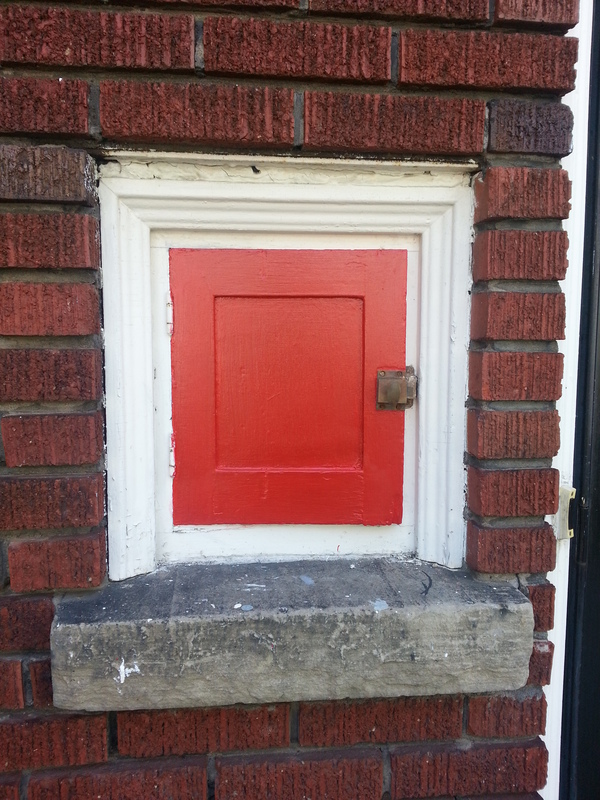 Even though the milkman no longer pays my house a visit the milk door still serves a useful function as our mailbox. Unfortunately it was looking pretty bad, with glossy blue and black paint. Not a color scheme I am fond of. Now that both girls are in school and I have returned to work I have also returned to “work mode” on the house…determined to wrap up a number of projects before the snow falls. 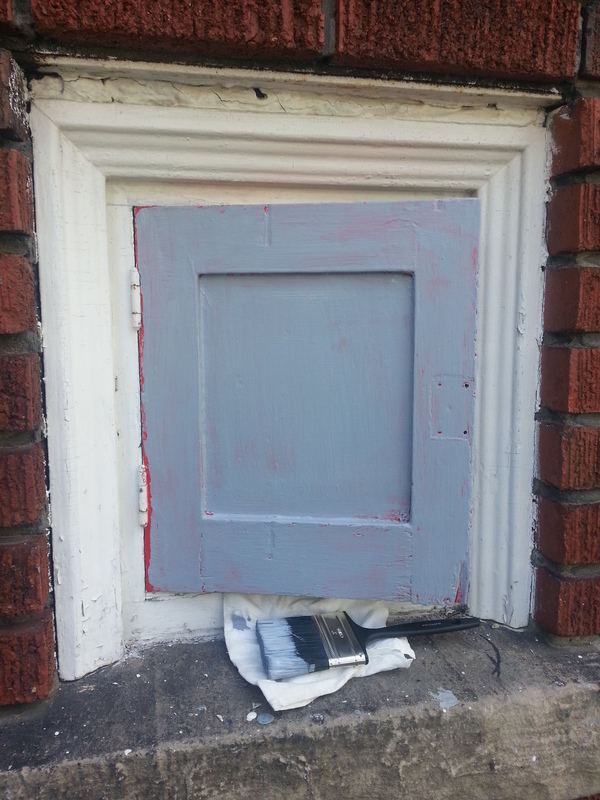 The first project is painting all of my exterior doors- starting with this little milk door. I have been pretty absent from blogging…but I have been busy! Do not make the same mistakes as me, I will embarrassingly tell you about all of my missteps so that you can avoid spending two days painting what seems like a simple and tiny area! First, do not assume it was painted with latex paint. If your house is as old as mine it probably wasn’t. 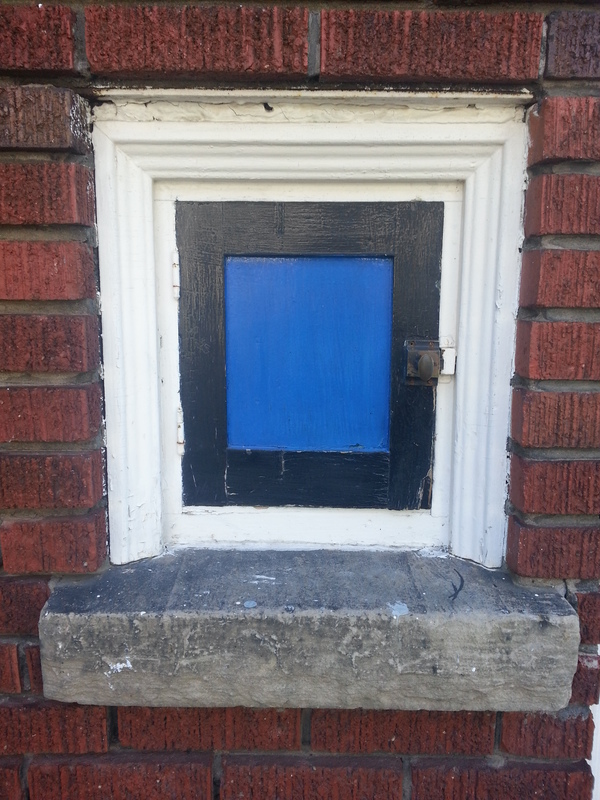 I did not think of this and tried painting right over the blue/black paint with my red paint. Not a smart idea. I had to wipe it off, sand it off and start over. It was not even sticking, but rather streaking across the door. Not pretty. Because I am cheap I then decided to cover it up with an oil based primer I had laying around. Kilz I believe. Remember- you can cover oil based primer with latex, but you can’t cover oil based paint with latex. I then painted 4 coats of my red over this primer layer. Still did not work very well. Red is a very hard color to get right! Since I knew I was also painting two full size doors this color I headed to the hardware store to purchase the right supplies to make my life easier- small rollers, sanding block and most importantly tinted primer! I then re-primed with the tinted primer (essentially starting all over again!) and covered it with 3 coats of paint. Voila. NOW it looks good! Not the most direct route to success, but my trial and error will make my other doors go that much faster. Until then, take a look at my beautiful shiny red milk door. Love it. 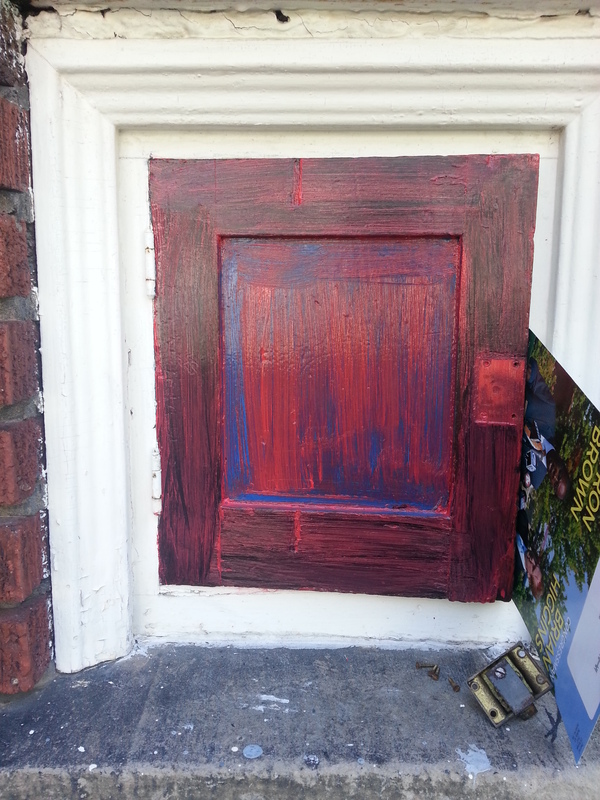 I took what I learned and painted my side and front doors too…much easier the second time around. Post to come. Once I make it through all of my home projects I will get back to sewing…I have made a few things since I last blogged but finding time to sew/paint/clean/work/prepare kids for school is stressing me out. Once my routine becomes easier I will get back to sewing. I miss it! Of course I had to make one for Eleanor too! 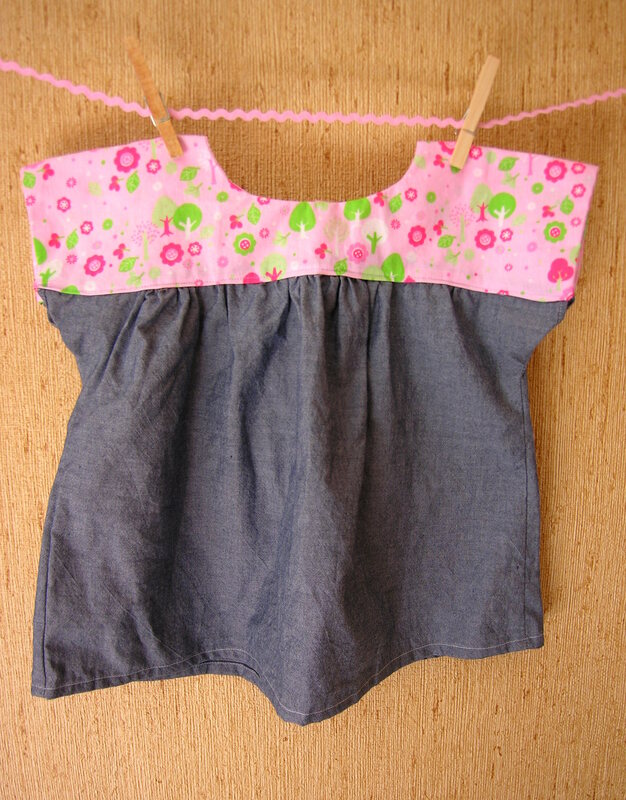 Hers is a size 5 with the Kaufman chambray on the bottom, and a pretty pink/green tree print fabric I picked up at Joanns years ago. I can’t wait to send her off to school in this, it looks so adorable. 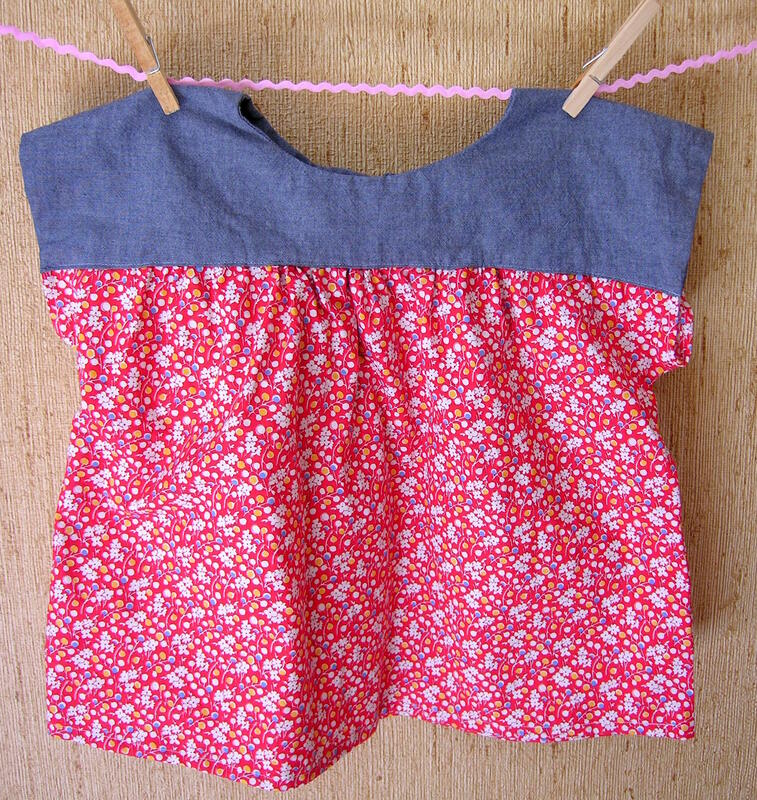 So strange to sew back to school clothes for Eleanor…I am really having a hard time with this one. Although I think I will welcome some free time (for the first time in over 6 years- I will be home alone for hours at a time!) it will be the end of an era, I have so identified myself as a stay at home Mom. This is strange, considering I have worked the entire time, albeit part-time. Now with both girl headed to school, my identity will certainly shift, as will hers. Lots of changes coming up for sure! I have to stop myself soon, or their entire closet will be packed with these tops. 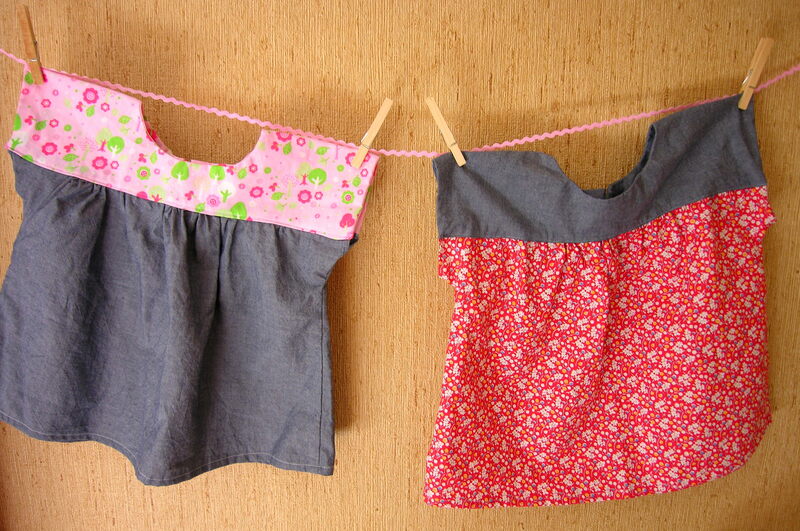 Well, maybe I’ll stop after I make a dress version for Isabel (or two). Views, views…I’ve surpasssed 1,000 views! 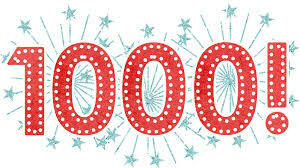 I am so excited to announce that my lowly little sewing blog has had over 1,000 views! (anyone with a real blog or website is probably laughing at this right now, I am sure there are plenty out there that get more than this each and every day!) I am feeling really proud of my numbers. 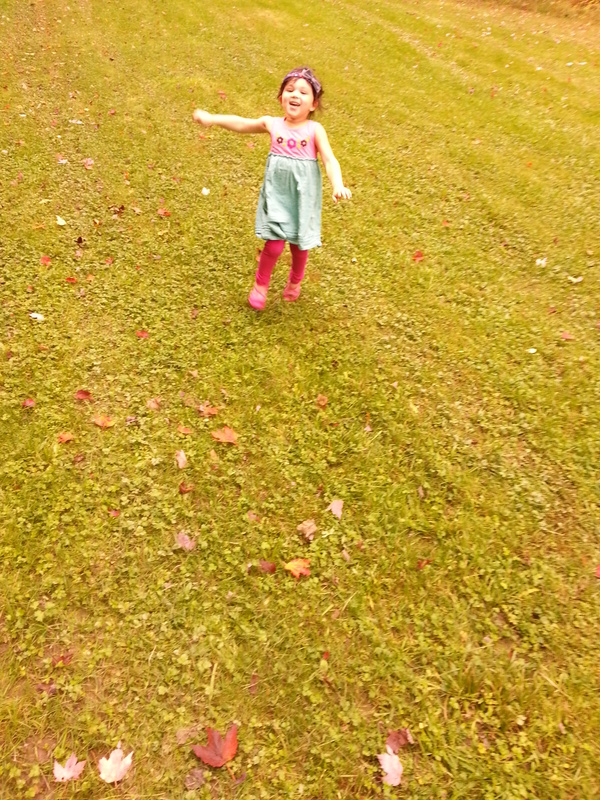 I started this blog as a project and an outlet for me to do over the summer, something to do for myself and connect with others while I am playing “stay at home Mom” to the girls. I have stuck with it longer than I thought and I am so happy to think that this many people have checked it out! With my return to work this week, and the girls heading back to school tomorrow I will have even more time to post and create and I hope the numbers keep rising! My main motivation for this is to post for myself, to keep a creative log of what I do and to connect with other people with similar interests and crafts- but it is pretty cool to track the statistics too! Why write it if nobody is reading it right?